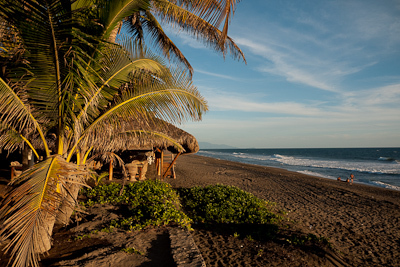 Guadalajara to Playa Real – finally, the coast! 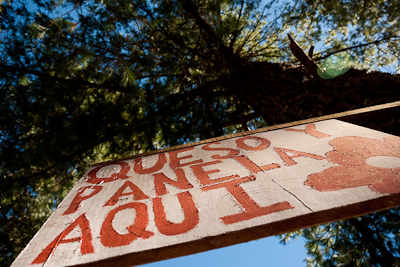 Guadalajara may be a city of some four million people – boasting the most dangerous bus drivers I have yet to come across – but at least it has the Bosque Primavera. 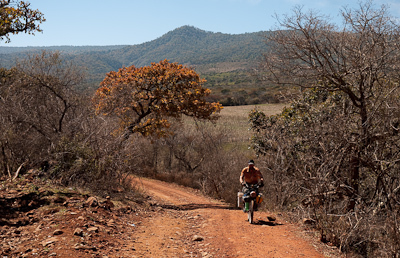 This massive green expanse is just a 12km ride away, and it’s network of dirt tracks provide the perfect easygoing exit - back into the mountains. We’ve all been nursing various ailments, so didn’t end up leaving the city until late in the afternoon. 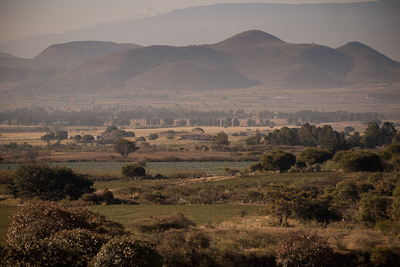 This is the view from our camspot, just 30kms from Guadalajara centre. There can’t be many cities of this size in the world where dirt roads like this are so close to the craziness of a modern metropolis. Pausing for a rest, and a freshly squeezed glass of orange juice. Uh oh. After several months of hard use on the roughest terrain, I spotted this crack in my Tubus Cargo rear rack. And although it didn’t seem structural, I figured it was best to sort it out sooner rather than later. 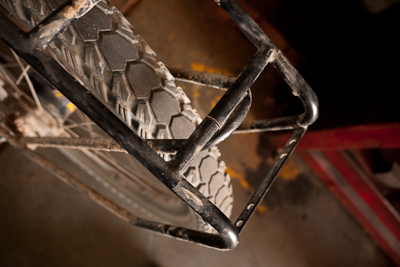 The good news is that Tubus racks are made from cromoly, so are easily welded anywhere in the world. The bad news is that, as the name suggests, they’re made from tubular steel. 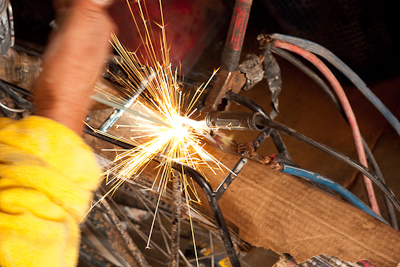 The mechanic who offered to help out wasn’t exactly a dab hand at his profession, as he ably demonstrated when he blew a sizeable hole in tubing. Still, it was easily filled in and patched up. Not the most graceful of fixes, but it works. The cost? 3 dollars. Not only that, but it was also a day of map innacuracies; we managed to get lost three times, adding 30km to the distance taly. Not great for morale, especially as we were all nursing our various illnesses – from spluttery coughs to violent vomiting – inherited after our soaking in the mountains en route to Guadalajara. Lunchtime at Lago Hartudo. 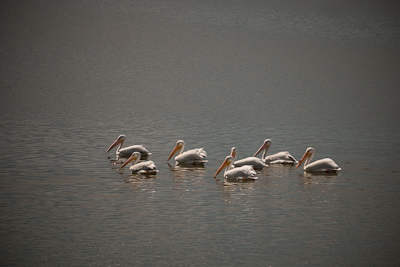 We stopped to share a platter of fresh fish with the pelicans. 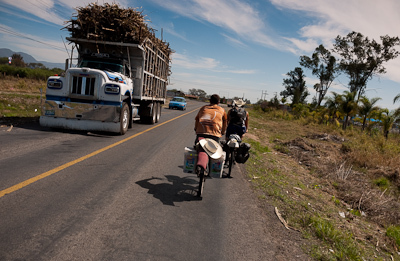 It’s starting to really hot and humid down here... Across the plains between Guadalajara and Ciudad Guzman, swathes of sugar cane plantations have appeared. Overloaded trucks protruding sticks of cane rumbled past on the narrow roads to the pungeant factories nearby. More Mexican hospitality. 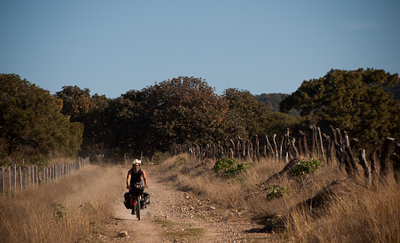 As we toiled up our next big climb, Jorge Mariscal and his family called out to us from their little Suzuki jeep, and offered to put us up in their simple ranch. 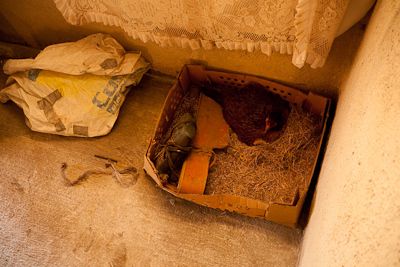 After filling us with food and even catering to Jeff and Jason's distinctly non Mexican vegetarian needs, we were offered a room shared with a broody hen. More cobbles! Lovely to look at, but a pig to ride up. This stretch was part of a 14km climb to Zayulapan. Zayulapan. 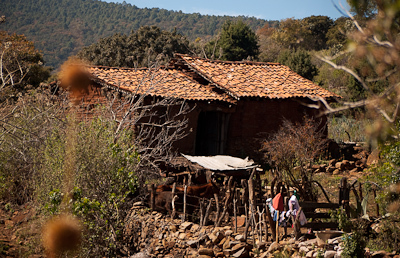 A ranchita of traditional tiled houses, where old men on donkeys trotted by as we sat in the shade and munched on pan dulce – sweet breads. 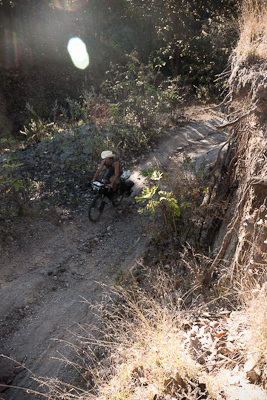 Then cobbles gave way to red dirt once more for round two of our climb into the sierra. Yep. We were heading back up into the hills once more. 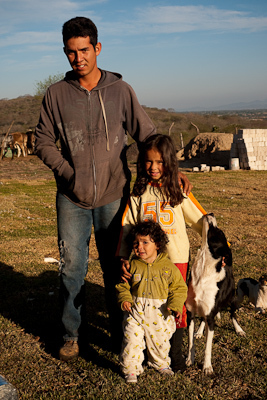 Is there another country as hilly as Mexico, I wonder? 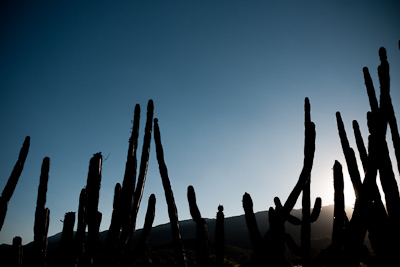 Our track wound its way every upwards through forest and cacti towards Atemajac de Brizuela. 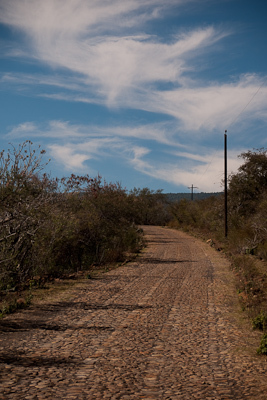 The stretch to Tapalpa, along a paved road hemmed in by pine forest and its wafty scent, felt like a quiet, idyllic mountain road in France. 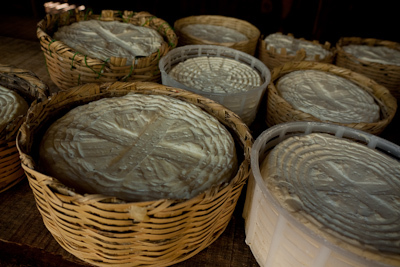 Especially with all the local produce – honey and cheese – sold along the roadside. A sizeable chunk if cheese set me back 20 pesos – a dollar and a half. 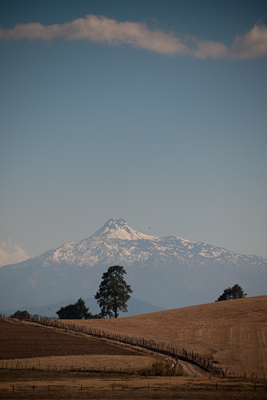 The road also offered some stunning views of the Parque National del Nevado de Colima, and its twin volcanos. An idea was hatched - to climb one. 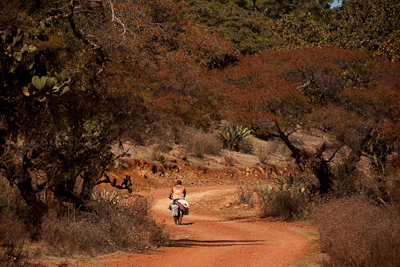 We were all set to toil our way up the 17 km dirt road to the park entrance. We knew the facts - it spiralled from 1700m up to a lofty 3200m. 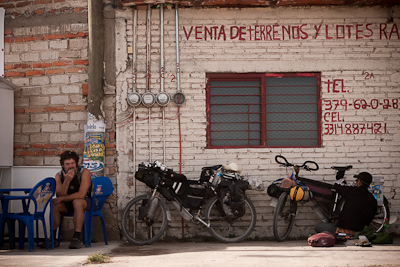 There, we planned to stash our bikes and start the hike to 4000m. 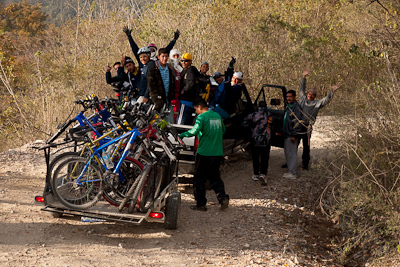 But as luck would have it, a band of local mountain bikers were doing the same thing, and we caught a ride up instead! 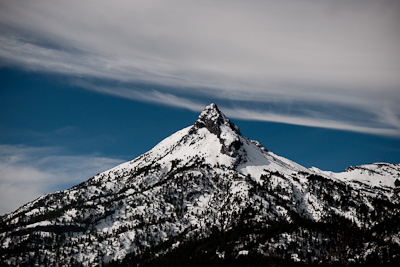 As we emerged at the guard station to the national park, Nevado de Colima, a dormant volacano of 4240m, sharpened into view. 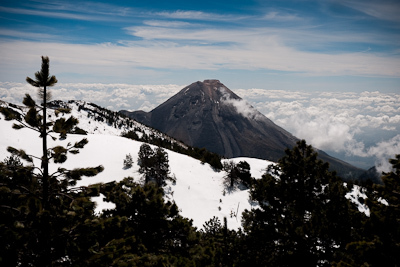 Up at the radio mast, perched at a lofty 4000m, the active little brother of Volcan de Colima appeared as if from nowhere, poking out from a sea of clouds. Incredible – one of the best views of the trip so far. 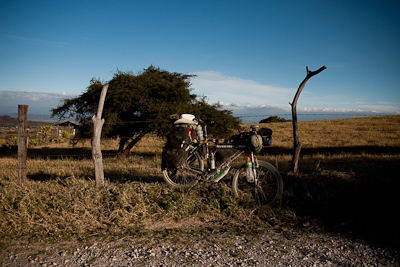 Then we hurtled back down the track to the plains, a descent of some 1500m in altitude. 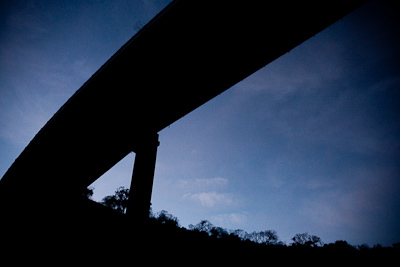 After hitting the highway, we found ourselves a camping spot beneath a 75m overpass – a vast slab of concrete cut a dramtic sight against the night sky and made for an unusual night's sleep. Above, haulage trucks heading for the coast rumbled past, lights sweeping the hills like the beam of a lighthouse, jackbraking as they descended. Still, joining the supernova highway wasn’t as bad as we were expecting, and avoided endless climbing through canyons thanks to its massive bridges that soared high above the forest. Thankfully, we skirted through the toll booth without paying. 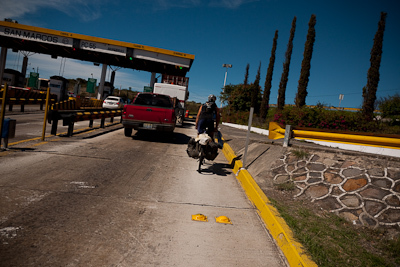 Plus, its generous shoulder provided sanctuary from the double-trailered haulage trucks to-ing and fro-ing from Manzanillo, Mexico’s largest port. 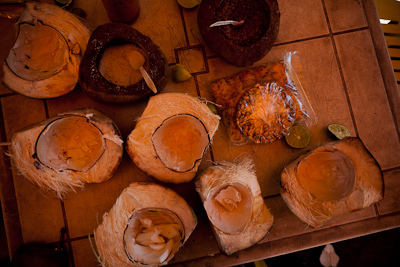 Coconut carnage. We must be getting close... Coconuts around here cost 8 pesos a pop, little more than 50c, and provide a refreshing drink, then a hearty meal. Mexicans sprinkle them with chilli sauce, salt and a squeeze of lime. Pulling off the highway, we stopped at a simple roadside restautant to refuel. The food made up for the views. 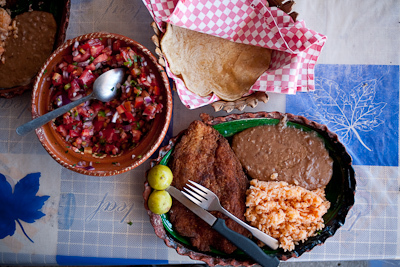 This delicious platter of breaded fish fillet, freshly made tortillas, rice, beans and tomato salsa, set me back 50 pesos. Less then 4 dollars. And amazingly tasty! Not so tasty. 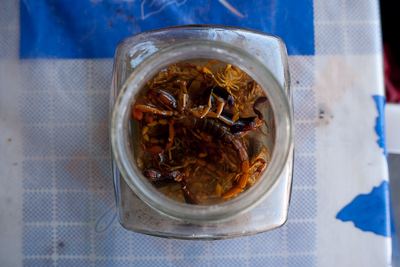 Scorpions caught crawling around the dusty floors of the restaurant, bottled to impress the clientele. I especially liked the decor. 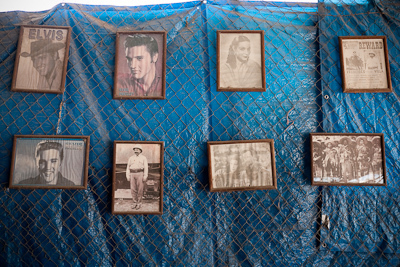 Pictures of Zapatista revolutionaries, Pancho Villa and Elvis… A great combo. Almost there! 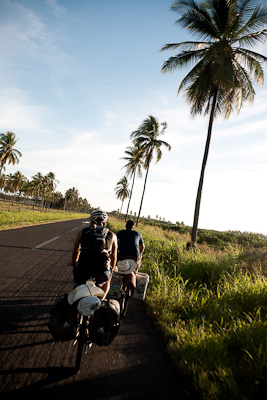 Coconut plantations and the last 10kms… At this point, Jason picked up the pace and took the lead. He was focused, and I sensed he might try and break away from the peloton in the final throws to water. A veteran of the island of Hawaii for seven years, Jason was anxious to get to the ocean by sunset. 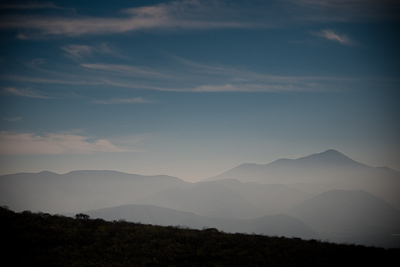 This entry was posted in Mexico on March 2, 2010 by Cass Gilbert. Wow, you put the whole “if your rack breaks in the field, you want it to be steel so a local can repair it” myth to the test! Well done. How is your suspension fork holding up? I’m thinking of buying one soon, as they are discontinued, but I’m worried about servicing it out on the road. 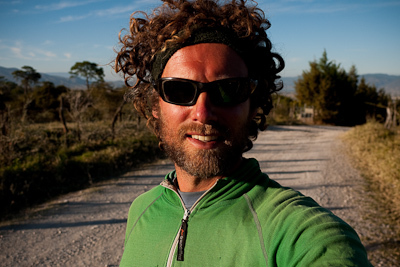 I’m planning a similar ride next year and this site has been a huge inspiration, thanks! so far, no issues with the fork I´m glad to say. and from what I´ve heard, they have a good longterm reputation. 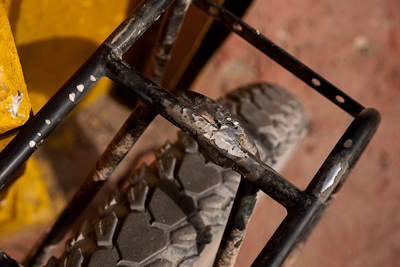 you could also look at an old pair of Marz MX Pros, they´re tough, low maintenance forks too. Glad you made it finally! Looks good. I’m still lost in the mountains, chasing butterflies. I’ve been reading your site since your days in Canada and find it really inspiring. I guess this is the end of your trip… thanks for sharing it with us, I wish you good luck! 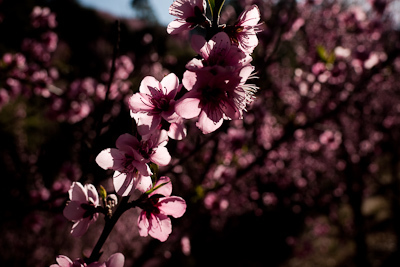 Maybe your pics catch the attention of an editor, they are beautiful and are worth being published. That’s a very nice site you have – shall have to check it out when i’m home (eventually) in bristol.